The KingSport baseball softball net is a convenient and collapsible sports hitting net that is perfect for softball and baseball pitching practice as well as tee-ball practice, in-field practice and soft-toss. The sturdy and resilient construction and design means that our baseball net catcher will endure a serious work-out time and time again. The uniquely designed bow frame of this sporting net allows a slight flex in the poles leading to a sturdy structural net that can easily handle all levels of hitting, pitching and throwing stress. Practice anytime, anywhere with a simple pop-up and collapse design with no tools required and a convenient travel bag included. The KingSport 7 ft. x 4 ft. Softball/Baseball Pitching Protection Screen is great to have on hand for batting practice and perfecting your swing with some soft toss. Super quick and simple to assemble and lightweight enough to easily take on the road for away games, the sturdy frame of this softball pitching protective net assembles and disassembles in minutes. The 7 ft. x 4 ft. pitching practice net provides a large enough area for hitters to take full-power swings without worry of missing the net. This baseball pitch nylon screen easily absorbs hits from soft tosses during batting drills and catches balls while pitchers work on their throws. Conveniently portable design l pitching screen can be set up without the fuss of tools and is designed to withstand abuse without tipping over. 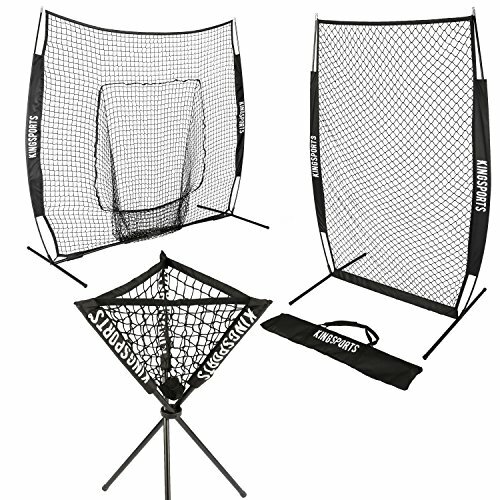 KingSports 7x7 Baseball/Softball Hitting Net PLUS KingSports I-Screen Pitching Net AND KingSports Ball Caddy - Save Your Back and Time! Perfect Set to practice hitting, pitching, and fielding! Easy to setup and take down! Ideal for travel and portability! INCLUDES: KingSports 7x7 Net, KingSports 7x4 Net, 2 Bow frames, Ball Caddy and 3 Black KingSports Carry Bags! If you have any questions about this product by KingSports, contact us by completing and submitting the form below. If you are looking for a specif part number, please include it with your message.